Air Fryer Chicken Wings are a great way to enjoy the taste and flavor of classic chicken wings without the guilt of eating deep-fried food! When I finally took the plunge and bought my air fryer I didn’t realize how much I would love it! We have the BCP 5.5 quart air fryer and we use it all of the time. Air Fryer Chicken Wings – moist and juicy on the inside with a crispy and crunchy skin on the outside. I knew that the primary purpose of cooking with an air fryer was to eat healthier but still enjoy the taste of ‘fried’ foods. Little did I know that the food would actually taste better than when cooked using traditional methods. Not only have we used it to replace our deep-fryer, but we also use it constantly for foods that are typically cooked on the grill or in the oven. When it was raining outside and I wasn’t able to use the grill to make hamburgers one weekend, I turned to the air fryer. 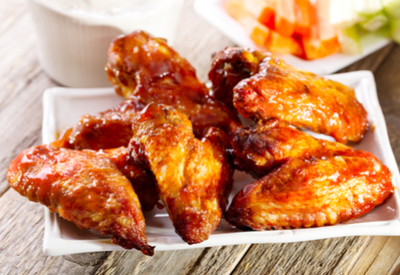 No worries if you didn’t thaw the wings – you can even make them from frozen in the air fryer. I honestly have never had a more juicy, perfectly cooked hamburger! And as an added bonus I didn’t have to stand over a hot grill to make them! And when it comes to Air Fryer Chicken Wings, the taste and texture is even better than deep-fried wings! First of all the skin becomes nice and crisp. And the meat inside is tender and juicy. But best of all, there are no worries of biting into a pocket of hot grease that is waiting there to burn the roof of your mouth! However, there is a trick to getting the wings perfectly cooked. If you prefer a dry rub on your wings, sprinkle on your seasoning half way through the cooking process. The initial cooking temperature needs to be lower than the final cooking temperature. This will allow the wings to have enough time to adequately cook without burning the skin. During the last few minutes of cooking, the temperature is increased to brown and crisp the skin to achieve that deep-fried taste. 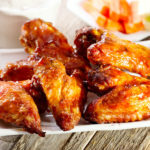 Some recipes will call for coating the air fryer chicken wings in baking powder or a breading to make them extra crispy. This simply is not necessary. With the cooking method stated above, the wings come out perfectly crisp each and every time! Yes, you can make your wings from frozen. In fact, I never remember to thaw them out on the day that I want to cook them. All you have to do is increase the initial cooking time by 5 minutes. It’s that simple! 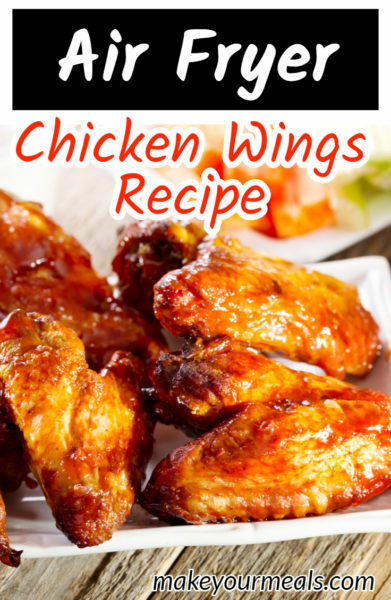 After your air fryer chicken wings have cooked toss them in your favorite wing sauce. 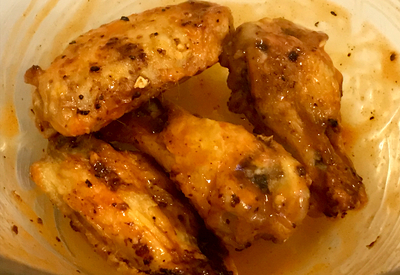 The beauty of making wings in the air fryer is that you can season them however you prefer. When using a dry rub seasoning, apply it when you turn your wings over during the initial cooking phase. If you like your wings coated in your favorite Buffalo or barbecue sauce, this is done after the wings have been completely cooked. Our favorite sauce is from the Anchor Bar in Buffalo, N.Y. They claim that this is the original establishment that ‘invented’ Buffalo Chicken Wings. See affiliate link to the Anchor Bar Sauce. Just toss the cooked wings in a bowl and add your favorite sauce. Toss them until well coated. The best part of all, you use multiple sauces to please everyone. Crispy chicken wings cooked in the air fryer with absolutely no oil! Season with your favorite dry rub or wing sauce for a great appetizer or meal. Place the chicken wings in the basket and close the air fryer. Cook for 25 minutes at 380°F . Turn the wings over at the 15 minute mark. 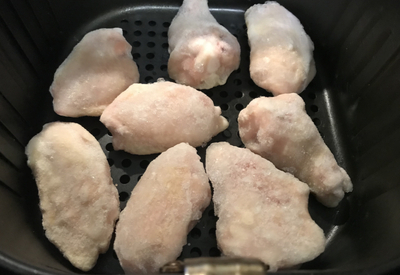 If using frozen wings, increase cooking time to 30 minutes. 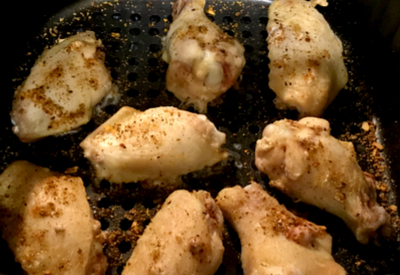 If using a dry rub, sprinkle the seasoning on the wings before and after you turn them. When the time is up, increase the air fryer temperature to 400°F and cook for 5 more minutes until the skin becomes brown and crisp. Thank you! I just made chicken wings using your frozen instructions and it worked perfectly! Put my favorite BBQ on it and they are so crunchy and tasty. They are one of our favorite things to eat! So glad you enjoyed them. Made these wings for our Super Bowl get together. We put them on the Keep Warm setting in the oven after they were done in the air fryer so we could make French fries in the air fryer to go with them. The wings were perfect!! Crispy, perfectly cooked, perfectly seasoned. Half with barbeque sauce and half with hot sauce and butter. This recipe is a definite keeper. We are so glad that you enjoyed them as much as we do!